In this walkthrough, we will be using the Voxel8 SolidWorks add-in to design, develop, and print a simple volumetric electronic circuit with a few parts. The printed object is a simply an LED, resistor, trace, and body of the enclosure to demonstrate how to use the Voxel8 SolidWorks add-in and some of its basic features and functionality. NOTE: This walkthrough is meant to demonstrate one way of working in SolidWorks to create your projects using parts and assemblies. There are numerous ways of working within SolidWorks for optimal results. This example uses the SolidWorks "3D Sketch on Plane feature" to layout trace within solid geometric bodies. Before you get started, you'll need to check the prerequisites below. SolidWorks - a version of SolidWorks 2015 or newer. Voxel8 SolidWorks add-in - If you have not already downloaded it, then you may run through the setup process from the previous SolidWorks tutorial, or download it here. Picture 1: The Voxel8 SolidWorks Add-in is installed under Control Panel->Programs->Install. Picture 2: The Voxel8 SolidWorks Add-in will also be present in the after installation, under Tools->Add-ins. 1.) How to make simple geometries from sketches. 2.) How to dimension modeled parts. 3.) How to Constrain parts. The first SolidWorks tutorial is oriented towards engineers who are not already familiar with SolidWorks and some of these CAD features. This tutorial assumes a bit more, but still attempts to step through in detail. Before starting this walkthrough, you'll need the following electrical components. 1 x coin cell battery, or a power source providing 3.3V. Picture 5: Coin Cell Battery. Once you have determined you have all the prerequisites, it’s time to start building the project. First, it starts by creating an assembly and its parts in SolidWorks. Follow the proceeding steps to create the basic volumetric LED circuit. Launch SolidWorks 2015 on your computer. Select File -> New or (control-N) to open a new SolidWorks document. Select “Assembly”, from the SolidWorks modal window. Picture 6: Creating the main assembly of the project. Picture 7: Confirming the Assembly construction. Create a new directory where you will store the project files (i.e. Documents/Voxel8). Save off the Assembly, leaving the name set to “Assemb1”. Picture 8: Saving off the Assembly to a file: "Assem1". While inside the Assembly create the first Part using “Insert Components”, and selecting “New Part”. Picture 9: Creating a the Body Part inside the Assembly. Save that part to a “Body” file. Picture 10: Saving the Body Part to disk. Now create a second part, using “Insert Components”, and selecting “New Part”. Rename the part to “Resistor”. Picture 11: Creating the Part for the Resistor inside the Assembly. Picture 12: Saving the Resistor Part to disk. Create a third part, using “Insert Components”, and selecting “New Part”. Rename the part to “LED”. Picture 13: Creating a new Part for the LED. Picture 14: Saving the LED Part to disk. Create a fourth part, using “Insert Components” and selecting “New Part”. Rename the part to “Trace”. Picture 15: Creating the Part for the Electrical Trace inside the Assembly. Picture 16: Saving off the Trace inside of the Assembly to disk in a file called: "Trace". When steps 6 - 10 are completed, you should have the an assembly that looks like the following. Picture 17: The Final Assembly for the project containing: Body, Resistor, LED, and Trace Parts. Open the “body.sldprt” file using File->Open and selecting it, or clicking on it in the Assembly. Select the front plane, and make it visible and “Normal To”. Picture 18: Setting to Normal to Front Plane. Picture 19: Enable visibility of the Front Plane. Select the Sketch tool from the top menu. Picture 20: Entering Sketch mode. Start to sketch a square of 2.0” x 4.0” using the “Center Rectangle”. Picture 21: Creating a Center Rectangle for the Body. Picture 22: Confirming the Rectangle creation. Start drawing a rectangle by defining some arbitrary height and width, first. Picture 23: A rough approximation of the rectangle before proper dimensioning. In the Stage around drag out out the rectangle to what you perceive to be roughly 4" x 2" and then confirm it to create it. Picture 24: A rough approximation of the body rectangle is draw onto the Stage. Now define the dimensions more strictly. Set the top dimension of the body width is 4" using Smart Dimensioning tools. Picture 25: Setting the dimension of the width. Picture 26: Setting the dimension. Now adjust the height settings of the body geometry. Select the height line from the Rectangle. Picture 27: Setting the dimension of the height. Next dimension the rectangle using “Smart Dimension”, and setting the height to 2". Picture 28: Setting the dimension of the width to 2". Picture 29: Setting the dimension of 2". Picture 30: Setting the dimension of 2". Picture 31: The dimension for the body is now 4" x 2". You should now have the following dimensions: 4" x 2". Picture 32: Rectangle is 4" x 2" for the body. Make sure the body is fully dimensioned. Picture 33: The body is now fully dimensioned and defined. Now give the body some depth by selecting the “Features” entry, and clicking on the “Extruded Boss/Base” option from the top menu. Set it to thickness of 0.25”. Picture 34: Beginning the extrusion process of the body. Access the geometry extrusion panel under Features for the Rectangle sketch. Picture 35: Modifying the extrusion settings on the body. Picture 36: Body has been selected. Picture 37: Surface Plane in the rectangle has been selected to extrude. Picture 38: Modifying the extrusion to 0.25" from default 0.5". You should now have a good body to embed components into. Picture 39: Body extruded and ready for components to be inserted. Picture 40: Rectangle has been extruded. Now use the mouse and view your creating volumetric body object in SolidWorks. Picture 41: The final rectangle after extruding. The next step is to measure your LED using a set of digital calipers, or download a 3D model of an SMD LED to use within your project. Acquire the width, height, and length of the SMD LED you will be using. Picture 42: Measuring the LED you provide with calipers. Now suppress the Body Part in SolidWorks. Picture 43: Suppressing the Body. Open the LED Part in SolidWorks. Picture 44: Drawing a rectangle. Create a second rectangle of the size of 1.8mm x 1.8 mm x 0.30mm, and extrude it to create a second geometry for your LED. First define the width of the LED. Picture 45: Defining the width of the rectangle for the width of the LED. Picture 46: Defining the dimensions of the width. Picture 47: Defining the dimensions of the height. Define the height of the part. Picture 48: Defining the dimensions for the height. Resize the height so it's also 07". Picture 49: Resizing the LED. Define the height to be .07" as well. Picture 50: Resizing the height. Picture 51: Resizing the width. Extrude the LED to a volume. Picture 52: Extruding the LED to give it depth. Picture 53: Adjust the thickness of the LED. The LED is now created. Picture 54: LED is now created. Save off the created volume geometry for the LED. Close the LED Part file and enter back into the Assemb1 Assembly. NOTE: If SolidWorks asks to rebuild the model then do so. Suppress the View of the LED. Picture 55: Suppress the LED. Select the Resistor Part in the Assemb1. Picture 56: Viewing the Assembly for the project. Select “Open Part”. Set the Front Plane in SolidWorks as viewable, and normal To. Picture 57: Setting to Normal to Front Plane. Picture 58: Enable visibility of the Front Plane. Create a new Sketch on the Front Plane. After creating the rectangle sketch, switch to Features mode. Picture 59: Creating the rectangle for a resistor part using the Sketch tool. Picture 60: Fully defining the sketch. Setting the width of the resistor using the dimensioning tool. Picture 61: Resizing the resistor. Picture 62: Resizing the resistor. Setting the height of the resistor using the dimensioning tool. Picture 63: Setting the height. The resistor sketch is now fully defined in SolidWorks. Picture 64: Resistor is fully defined in SolidWorks. Editing the height of the resistor. Picture 65: Editing the height of the resistor. Setting the height on the resistor using the Dimensioning tool. Picture 66: Setting the height using the Dimensioning tool. Changing the height and width to 0.03" x 0.03". Picture 67: Setting the size of the resistor. Selecting the surface to extrude. Picture 68: Selecting the surface to extrude. Now, we extrude the resistor. Picture 69: Extruding the resistor. Extrude Boss/Base in the top menu, and set the height to 0.05". Picture 70: Setting the extrude depth of the resistor. With the resistor geometry now created with volume using the extruded boss/base, save the file. Picture 71: Resistor geometry is completed. Picture 72: Inside the project assembly. Hide the LED Part, by suppressing it in SolidWorks. Picture 73: Hide the LED inside the assembly. Now that the LED Part and Resistor have been created, it is time to work on the body and placement. Set the view in SolidWorks in Assemb1 to be normal To Front Plane, so it’s a top down view of the parts. Picture 74: Setting to Normal to Front Plane. Picture 75: Enable visibility of the Front Plane. Now we’ll want to move the LED and Resistor so that they are embedded into the top of the Body object, by using the “Move Component” feature in SolidWorks. Select the Resistor Sketch inside the Extruded object and then hit the “Move Component” option. We'll do this through SolidWorks mating. Picture 76: Moving components onto the Body volumetric body. Right click on the Resistor Part and set it to “Float”. Mating LED to the Body geometry. Picture 77: Mating the geometry to the Body Part. Picture 78: Mating the geometry to the Body Part. With the LED and Body selected, you can mate the faces together. Picture 79: Mating the faces of the LED and Body. Picture 80: Mating the faces of the LED and Body. Drag the Resistor part over into the Body of the Assembly. Picture 81: Dragging the resistor Part onto the Body Part. Now move the resistor using the same technique as the LED, with mating and moving the component. Picture 83: Moving the resistor Part onto the Body Part. Picture 84: Selecting the LED component. Picture 85: Dragging the LED and into place over the body geometry. Now the LED and Resistor are embedded into the body. Picture 86: Resistor and LED Parts are now embedded within the Body Part. Here is the wireframe view which shows the resistor and LED embedded into the very top of the body. Picture 87: Wireframe of the placement of LED and Resistor within the Body Part. Below is the top down view of the Front Panel with the embedded LED and Resistor within the Body. Picture 88: Top Down View of the Front Plane showing embedded LED and Resistor in the Body. With the LED and Resistor now sitting inside the volumetric Body, it is time to lay out the trace that connects the electrical components. The first is by using centerlines inside of SolidWorks. Picture 89: Centerlines (or Lines) for traces. The second is by using the 3D Sketch on Plane tool to draw along a surface. In our example, we’ll be using the second method, as it is is easier to quickly lay down trace. Picture 90: 3D Sketching on a plane for traces. Picture 91: Traces in the voxel8 add-in are sketched with line segments. Switch to Wireframe mode, and notice that both the LED and resistor are embedded into the top of the Part. Picture 92: Wireframe mode for the assembly. Select the “Trace” Part inside of the “Assemb1” Assembly. Picture 93: Line traces are constructed within the Traces Part inside of the Assembly. Below is the Body geometry with the resistor and LED positioned above the part before embedding them into the solid body. Picture 94: The LED and resistor are resting on top of the rectangular body geometry. Picture 95: Front Plane of then Body selected. Zoomed in on resistor and LED. Picture 96: Zooming into Resistor and LED Parts within the Body Part. Start Creating the Trace using the 3D Sketch tool. Picture 97: Starting to generate the trace. Creating the first trace using the 3D Sketch line segment tool from the resistor to the LED. Picture 98: Using the SolidWorks 3D sketch tool to connect the LED to the resistor. Front plane view of the resistor and LED over the body geometry. Picture 99: Front Plane view of the Resistor and LED over the Body part. Picture 100: Connecting the trace between the LED and resistor. Picture 101: An isometric view of using the 3D sketch tool to connect the LED and resistor together with a line segment. A second line segment is created using the 3D Sketch on Plane tool from the LED. Picture 102. Another line segment sketch line created by the 3D sketch tool. Making the trace line segment using the 3D Sketch tool. Picture 103: Defining the trace segment in SolidWorks. Adding the second trace line from the resistor part. Picture 104: Second trace line is created using the 3D sketch tool. Viewing the circuit construction in SolidWorks wiremode. Picture 105: Viewing the Body, Resistor and LED with trace in wire mode. Picture 106: Trace Connections have been made in the Body Part to the Resistor and LED. Now that trace lines have been created, it is time to use the Voxel8 add-in, and convert the 3D sketched lines into trace. Select all the lines to convert to traces. Picture 107: The traces are in place within the body. Picture 108: Convert to Trace with the Voxel8 add-in. Sending your assembly to the Voxel8 printer is as easy as hitting the “Send to Printer” button within the Voxel8 SolidWorks add-in interface. At this point, the add-in will send the gcode to the Voxel8 dashboard so it can be printed. Picture 109: Sending your model to the Voxel8 Printer. Alternatively, you can download the generating .STL files and upload those to the Voxel8 Dashboard. Picture 110: Export to STL. Picture 111: Generating .STL files to upload. Next up is slicing process of the model you have just created. Once you have completed the project within the Voxel8 SolidWorks add-in, it’s time to print it. To do this, we’ll be using the online Voxel8 Dashboard located at: http://dashboard.voxel8.co. NOTE: If you have followed the steps in the visual start guide then you should already have an account to login to, otherwise you'll need to register now. Picture 112: The Voxel8 Dashboard. If you used the “Send to Dashboard” option from the SolidWorks add-in, you’ll see a build entry listed. If you downloaded the .stl files instead, then you’ll want to create the “New Build” button, and then upload your files. At the visualizer stage, you will see your project that contains the component geometries and the trace. You can modify the name of the project by clicking on the “Name” field and modifying the text. At this stage you should verify that the plastic and silver parts of your model are correct before continuing. For the configuration options you will select the “Official Voxel8 DevKit Beta” entry from the dropdown list. The next step is to “slice” the model using the “Slice” or “Re-slice” button in the bottom right hand corner of the Dashboard UI. Once the model is sliced, you’ll want to print the part. Clicking the “Send to Printer” button will get the process started. d.) the build plate has been leveled recently, and the alignment script has been run and succeeded. If the printer is ready, then touch the Print button to start the print job. The printer will take some time to complete, but it will pause along the way for component insertion, at which time the LED and resistor should be carefully placed in their respective places with the plastic body. Using a pair of tweezers is easiest to do placement with small, SMD components. Orientation with the LED will matter, so you’ll want the positive side of the LED matched with the trace on the printed part. Either orientation of the resistor will work fine, however. Once the part is printed, you’ll need to carefully remove it from the build plate. To do so, find a razor blade, or a metal spatula and carefully pry it off the blue tape. Examine your part and verify that it printed correctly, and that the LED and resistor are placed correctly within the plastic enclosure. You’ll want to wait 10-20 minutes before you start testing the printed part for functionality. This will allow the conductive ink to solidify and dry. After the 10-20 minutes, the part should become more conductive and be ready for the next step; testing. Congratulations, you’re ready for testing the part, now. Now that the part has been printed, it is time to test it. To do so you will need a power source, like a 3.3V coin cell battery. You can also use a multimeter to test. Hook up alligator clip leads to positive and negative ends to the respective ends on the battery. The LED should come on when both leads are connected. If the LED fails to illuminate when perform some troubleshooting on the positive and negative printed trace using a multimeter. Otherwise you should retrace your steps to make sure you followed the instructions closely. If the LED lights up when power is applied then congratulations on your 3D printed electronics! From here, you can delve into more complicated CAD models using the Voxel8 SolidWorks add-in to create new inventions never thought of before. 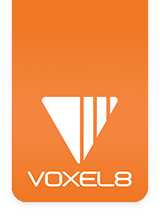 If you would like to explore another component based project, check out the Voxel8 logo project.